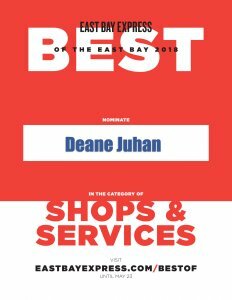 Nominate Deane Juhan for Best of the East Bay 2018! Nominations for the Best of the East Bay 2018 are now open! Deane Juhan is a Trager practitioner, trainer, and author of the famous textbook Job’s Body: A Handbook for Bodywork, Instructor Practitioner Of The Trager Approach. Deane’s goal is to educate therapists and the public to the wonders and workings of the human body, the impact of somatic awareness upon physical health, performance, self-development and consciousness and perception. Nomination ends on May 23, 2018, and voting starts on Jun 6, 2018! What are you waiting for? Nominate your favorite local businesses! Note that there is no bodywork category, but there is a massage therapy category.